So I’ve been here for about a month now, and have another month or so to spend in the country (or these countries, or this country and a half). As I reflect on what I’ve seen and done so far, however, I can’t help feeling a sense of dissatisfaction at myself: I really need to get out more. As I was saying, the jaunt I took was in E1–the so-called “Judean Wilderness.” When you first walk into the “desert” there, it seems uninhabited–so obviously uninhabited that you could be forgiven for thinking that you’ve come upon a land without a people. But then you look more closely, and you see the first signs of habitation, followed by the second, and the third–so that after an hour or so, you realize that what had previously seemed “uninhabited” is not just inhabited, but in some sense entirely appropriated. In fact, one of the first things I ran into when I got to the desert was…a fence preventing me from going any further into the desert, or rather, requiring me to go around it if I wanted to go anywhere at all. Here’s one of the earliest indications of habitation. I’d been walking for a bit when I came on these shepherd’s shanties by the side of the road. I take it that they’re just temporary shelters to keep the shepherds out of the sun (obviously, there’s no shade for miles). They own those, right? It’d be trespassing to use them without the owner’s consent, and something like theft to destroy or bulldoze them without the owner’s consent. Maybe morally, but not by law. Legally, none of this property has any valid status; it’s all illegal. If you look to the left, there’s a big valley with a sort of shantytown nestled within and a village on the mountaintop. The mountaintop is (just barely) on the electric grid, but the shantytown is not. So what do these people own? The clothes on their back? That plus the shanties over their heads? The mountain? That plus the valley? Does that include the roads you see and the reservoir as well? Could they legitimately say that they own all that the eye can survey? And whose eyes would those be–Israeli, PA, or Bedouin? These people are living “illegally,” as well; in fact, their whole existence is illegal. It’s a lot to think about, and part of the reason I find it hard to leave my immediate environs is that I find that those environs by themslves give me more than enough to think about–more, in fact, than I can handle. I sympathize with the plight of these Bedouins, but the status of their claims is not clear to me. After all, it’s not clear to me that if a bunch of Bedouins showed up in north Jersey, they’d be able to appropriate whole mountains and valleys of this size for their own use, exclusive of the development needs of neighboring towns or any other claims. What would happen to them if they tried is anyone’s guess (try to imagine it happening in Sussex County or in the Pine Barrens)–though a hard look at the remote origins of our Indian reservations suggests one possible answer. That’s not a moral judgment; it’s just an observation in need of a moral judgment by a mind better stocked with answers than mine. Here’s a shot looking into the distance at the northeastern horizon. What you see in the distance is Ma’ale Adumim, a Jewish settlement about the size of my hometown of West Orange, New Jersey (and which actually looks a lot like West Orange). 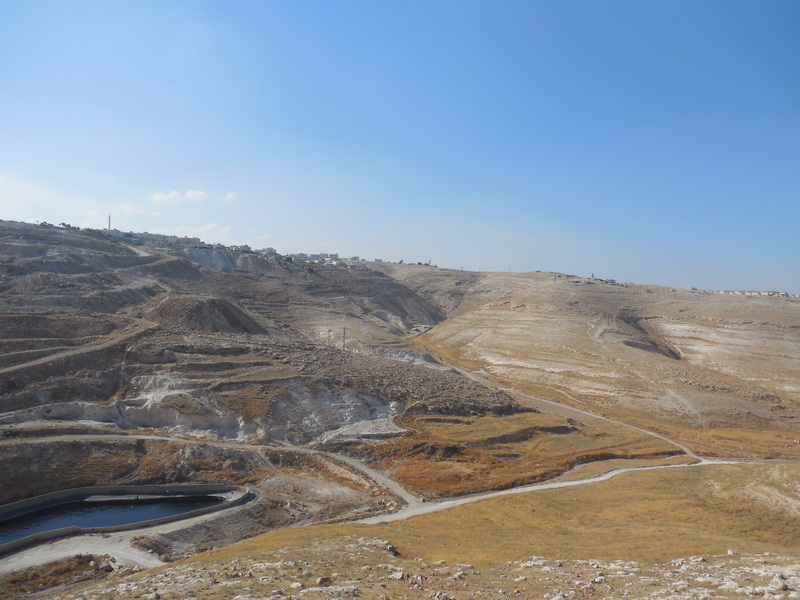 The road that snakes through the picture goes to Ma’ale Adumim and by a roundabout route to Jerusalem. We take “civilized” life for granted, and usually take for granted that the displacements it required took place in some distant and morally irrelevant past. But a look at E1 and similar places here suggests that that isn’t so. The displacements are happening now, and happening in the name of the imperatives of civilized life. One of the (many) things that gives the Arab-Israeli dispute its urgency for Americans is the way in which it re-enacts the worst (and most tragically forgotten) aspects of our own history, when we were the Israelis, and our adversaries were the Palestinians. The displacement of the Bedouins in E1 sounds uncomfortably like a 21st century version of the Trail of Tears. It sounds that way, but is it? A complex question in need of an answer that I don’t have. Anyway, I started out by saying that I need to get out more, and I do. I’ve gotten a great deal out of teaching my political philosophy class–we’re currently finishing up Machiavelli’s Prince–and I was right to think that my Occupation-based approach to the classic texts of European political philosophy would pay the hermeneutical dividends I anticipated. I’ve also gotten a fairly good sense of the rhythms and details of life in my immediate vicinity, and made a couple of trips to Jerusalem and Ramallah. In the case of any person whose judgment is really deserving of confidence, how has it become so? …Because he has felt that the only way in which a human being can approach to knowing the whole of a subject is by hearing what can be said about it by persons of every variety of opinion, and studying all modes in which it can be looked at by every character of mind. I haven’t really done that. I’m ensconced here among Palestinians in a cocoon of Palestinian political and religious opinion. Everyone here is opposed to the occupation and to the settlements–in a fundamental way, to Israel itself. So the time has come, I think, to hang out with some Israeli settlers. To that end, I’ve made arrangements over the next few weeks to meet one set of settlers through this tour; another through this one; and to visit Ma’ale Adumim through this program. (Here’s a description from 2010; here’s one from a few days ago focusing on East Jerusalem rather than Ma’ale Adumim.) The second of these tours will enable me to visit the Temple Mount/Haram Sharif in the company of Jewish settlers, something I never imagined myself doing before, and which fills me with a peculiar mixture of apprehension and amusement. I’ll be visiting Hebron through this tour, and spending time in a Bedouin village in the Negev on this one; though the description of the Hebron tour doesn’t say much about interacting with settlers there, I’d like to see how far I can get in the direction of interaction with them. Though I’m not totally sure I can schedule it, I’m hoping to spend a couple days re-visiting the village of Beit Umar through this program; I had an “interesting” exchange with an Israeli military patrol last time I was there, and I’m hoping that I can meet my old “comrades” in that unit once again and re-start the argument where we left it two years ago. I’m curious what PoT readers are curious about. Any questions you think I ought to be asking, or things I ought to be looking for? Tell me. *”The Treaty of New Echota was ratified by a single vote…” Recall the old axiom, care of Anthony Downs, that a single vote almost never alters the outcome of an election in a politically significant way. “In a large election, the probability that an individual vote might change the election outcome is vanishingly small.” Almost, vanishingly small: sometimes the odds get even. Postscript, July 19, 2015. Here’s a useful map depicting the places described in this post. (It’s a PDF; unfortunately, I can’t copy and paste it.) I took the long road that starts from the “b” in Abu Dis, and took it past Sawahrah as-Sharqiyah, bypassing Container Checkpoint, and doing a half-perimeter of what’s marked “the alternate site” in E1. 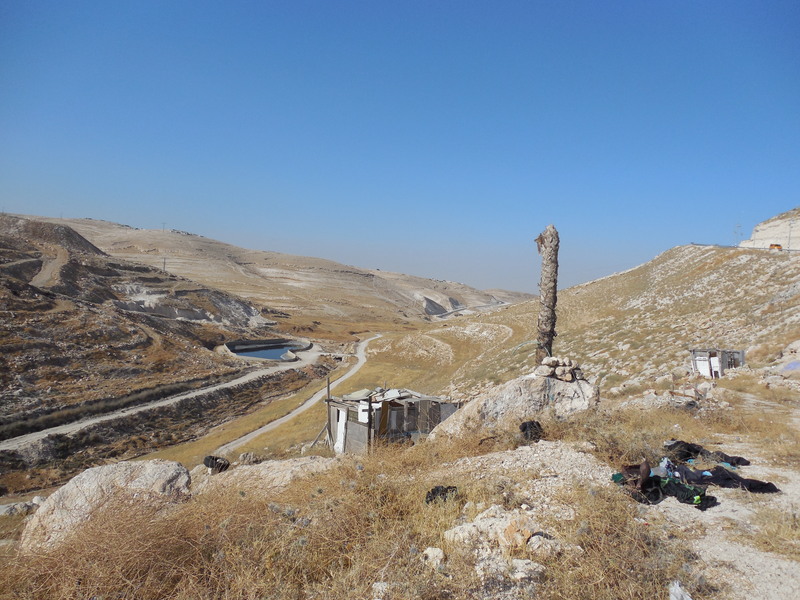 The map indicates that all of the land I photographed, though physically inhabited by Bedouins, is within the municipal boundaries or Regional Council jurisdictional area of the surrounding Jewish settlements (either Ma’ale Adumim or Qedar). The realization of the E1 plan would require the expropriation of all of the Bedouin encampments located within the blue space on the map. It’s an interesting question what moral justification anyone could have for doing this. Even if you argue that Bedouin appropriation of land has to be limited by some version of a Lockean Proviso, it’s unclear how the surrounding settlements could be entitled on the same grounds not only to what they currently have but to everything that the Bedouin have–despite the fact that the Bedouin are on the land, and the settlers are not. Though I haven’t read as much of it as I should, I get the impression that libertarian discussions of property are, in their current form, ill-equipped to adjudicate disputes of this sort. Likewise Lockean discussions. It’s unclear to me whether Lockean/libertarian accounts can be developed into adjudication-worthy theories, or whether they have to be junked in favor of something different, and more adequate to the task. Postscript, July 20, 2015: This article from Reuters is exceptionally informative on the plight of the Bedouin in E1. 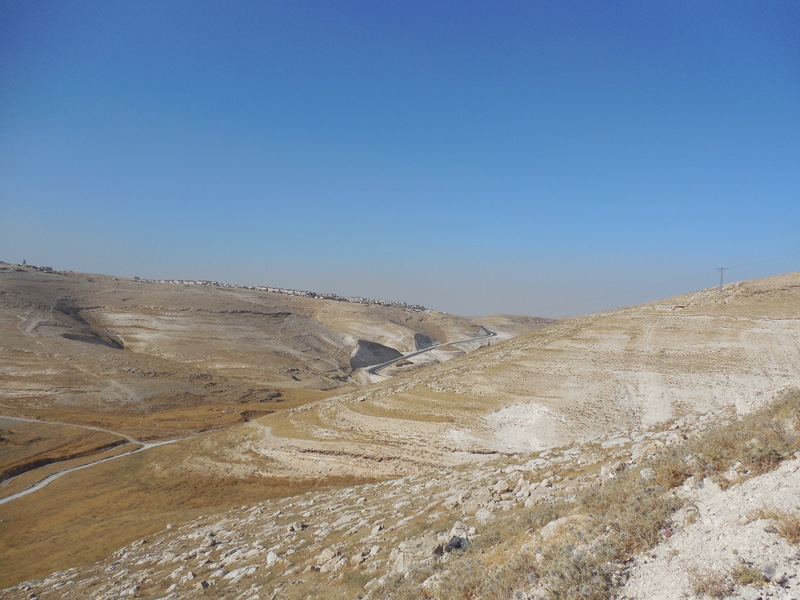 Postscript, July 24, 2015: Another informative article, this one on the hamlet of Susiya in the southern West Bank. This entry was tagged Israel, Palestine, political philosophy. Bookmark the permalink. Maybe you can ask how the settlers feel about staking residence on expropriated land and compare/contrast their feelings with the feelings of Palestinians who were the victims (or descendants of victims) of expropriation. Ultimately I’d like to know if Israeli settler attitudes with respect to expropriation bear a resemblance relationship to the American suburban entitlement mentality you’ve written about here at PoT. Maybe you can throw in some confrontational interviewing while you’re at it for a good measure. Though once I’m free from one prison I’ll gleefully share my thoughts on another. Now’s the time for me to invoke that old postcard cliche: “wish you were here”! It’s actually a feature of the tours that I’m taking that I can’t engage in confrontational interviewing. One tour is organized by a left-wing organization but led by a settler, and the other is led by a settlement group. It’s an explicit condition of the first tour that I can’t be confrontational, and an implicit condition of the second that I can’t. I have to function as an observer and ask relatively neutral questions. I think I’d re-word your question by asking them whether they think they are staking residence on expropriated land, and I suspect they’d say “no.” In the case of Ateret Cohanim, the land to which they’re staking a claim is on the eastern side of the separation barrier that passes through Abu Dis; I pass by it everyday. The land in question is uninhabited and has the status of state land. It’s off limits to Palestinians and open only to Israelis (though I’m not sure whether that means Israelis or Jews). I think AC’s view would be that Israel is within its rights to designate land as state land to consolidate the state’s hold over Greater Jerusalem, which will function as a “shield” (magen) for Jerusalem. Palestinians are obliged (by the terms of Oslo) to develop on their own side of the wall. But I’m putting words in their mouths. I’m curious what they’d actually say. Which is why I’m going! Actually, part of the reason I want to talk to settlers is that I frankly do not understand the mechanism of property transfer at work here. Settlers speak constantly of buying land from willing buyers; Palestinians speak of fraud and collaboration. It’s amazingly difficult to get a straightforward factual characterization of the principles of property transfer involved. So my aim here is pretty modest. I literally just want to figure out what happens when a settlement becomes a settlement. I’ve heard the way Palestinians describe it; now I’d like to hear how settlers do. At some point, I’ll need to sit down and sort out what it all amounts to. Will read the Flickers of Freedom stuff when I get a chance…and look forward to anything you send our way…. By the way, speaking of confrontational, have you followed the discussion on my first BDS post? Will respond to that tomorrow, if I get a chance.